Medical Home --- Each of our patients now have what they have never previously had; a Medical Home. Our patients now come to the Troup Cares Free Clinic at the onset of medical issues and are able in most cases to correct them at that time. This eliminates costly trips to the Emergency Room and potential hospital admissions. Our patients know that we care for their well being. 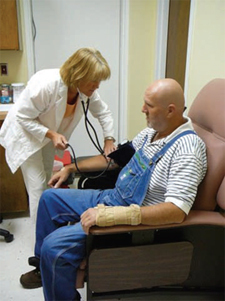 Disease Management / Patient Education --- Our full time Program Manager / Registered Nurse is able to work with each patient and outline an individual program of care for each. The Disease Management Program covers everything from proper diet, proper prescription drug usage, how to refill prescriptions at the proper time, etc. We have also established a Patient / Clinic Responsibility document for review with each new patient as they arrive at the clinic for their initial visit. Our nurse practitioner works within the Disease Management framework thus providing the best medical care and management possible. Prescription Assistance Plan (PAP) --- Our in-house dispensary works in concert with pharmecudical companies, retail pharmacies and other direct relief agencies. Our team monitors prescription drug usage and timing for resupply to make sure that our patients have adequate medication on an ongoing basis. Nutritional Education & Counseling -- Instruction in proper dietary guidelines is part of the Troup Cares Disease Management Program. A registered dietitian and Certified Diabetes Educator conducts a group nutrition class at the clinic on a monthly basis. General Social Services -- Standard medical and general social services are provided to Troup Cares patients including prescription assistance, help in determining appropriate health care and other health services, and referrals to other organizations or agencies.